Helen Holmes (June 19, 1892 – July 8, 1950) was an American silent film actress, most notable for starring in the serial The Hazards of Helen. Helen Holmes was born on June 19, 1892 in Illinois. While there is uncertainty about her place of birth, Holmes stated in an interview that she was born on a farm in South Bend, Indiana, but grew up in Chicago, Illinois. A 1917 article indicates Holmes was born on her father's private railroad car, "Estevan". Holmes was the daughter of Norwegian immigrant Louis A. Holmes (born in Norway in October 1862), a railroad clerk employed by the Illinois Central Railroad, who had migrated to the United States in 1867, and his wife Sophia (born April 1869 in Indiana), and was the sister of Frank O. Holmes (born June 1889 in Illinois) and Florence (born in May 1896 in Illinois), and two other siblings who died in infancy. Holmes was educated in St Mary's Convent in South Bend, Indiana. Holmes began working as a photographer's model but turned to acting, performing in live theatre and making her Broadway debut in 1909. She became friends with film star Mabel Normand. Due to tuberculosis in the family, about 1910 Holmes and her widowed mother and siblings moved to California Valley, a few miles east of Shoshone in Death Valley, California, where they lost their life savings in a real estate swindle buying a property by the Colorado River. Meanwhile, Mabel Normand moved to Hollywood in 1912 to work at Mack Sennett's Keystone Studios, she encouraged Holmes, after her brother had passed on, to try the film business in the balmier climes of the West Coast. Holmes began her film career in 1912 with Keystone in a bit part arranged by Mabel Normand. She made only a few more appearances in Keystone films and, although attractive, her lack of glamorous beauty relegated her to secondary roles until late 1913 when she signed with the Kalem Company's new Hollywood studio. Helen Holmes' first film at Kalem was directed by J.P. McGowan whom she would develop a relationship with and soon marry. In her first two years with Kalem Studios, Holmes appeared in more than thirty film shorts during which time her athletic ability to do physically demanding stunts led to her big break. At a time when the women's suffrage movement was much in the news, in March 1914 Kalem Studios' competitor Pathé Frères released an adventure film serial titled The Perils of Pauline. Starring Pearl White as a bold and daring heroine, the Pathé serial became an enormous box-office success. As a result, Kalem Studios jumped on the bandwagon and in November 1914 released their own adventure series called The Hazards of Helen. Cast as the series star, during the twenty-six "thrill-a-minute" episodes in which Helen Holmes performed, she did almost all of her own stunts. 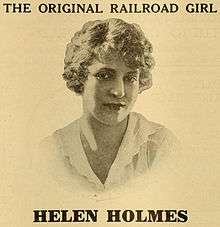 Playing an independent, quick-thinking and inventive heroine, as part of her dangerous exploits Helen did such things as leap onto runaway trains or treacherously chase after bad guy train robbers. While occasionally the plot called for Helen to be rescued by a handsome male hero, in most episodes it was the dauntless Helen herself who found an ingenious way out of her dire predicament and single-handedly collared the bad guys, bringing them to justice. 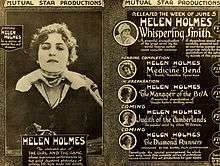 The Hazards of Helen made Holmes a major star and she and her now husband, director J.P McGowan, decided to capitalize on her fame and left Kalem to work for Thomas H. Ince Productions and Universal Pictures. After a few films, Holmes and McGowan formed Signal Film Productions to make their own adventure films. Between late 1915 and early 1917, they made a dozen films together that met with reasonable success but financial and distribution problems ended the production partnership and Holmes did not appear in another film until 1919, this time as the star in another film company's production. In 1919 and 1920 she made only one film each year and only two in each of the next three years. 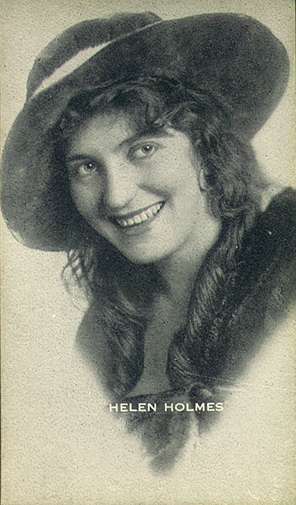 Between 1924 and 1926 Helen Holmes made eighteen more short adventure films, but her popularity began to wane in a market over-saturated with female cliffhanger films. Holmes made several Westerns opposite actor and rodeo performer Jack Hoxie in the mid-1920s. Throughout her career Helen Holmes had occasionally gone back to performing in the theatre, and with the end of her marriage in 1925 she returned to the stage, making her last appearance on Broadway in 1935. She eventually married film stuntman Lloyd A. Saunders and as a result of the popularity of the Rin Tin Tin dog films, the two began training animals for use in the movies. After retiring from movies Helen ran a small antique business in her San Fernando home. She had an extensive collection of rare dolls. Lloyd died in 1946, and Helen died in 1950 as a result of heart failure. She had been ill for five years with a heart condition. She died in Burbank, California at her home, 1401 West Olive Street. She was 58 years old. Funeral services were conducted at Pierce Brothers Hollywood Chapel at 5959 Santa Monica Blvd., Los Angeles, California. She was interred at the Forest Lawn Memorial Park Cemetery in Glendale, California. ↑ While some references state Holmes was born on July 7, 1892, and indicate she was born in either South Bend, Indiana or Louisville, Kentucky (e.g. Buck Rainey, Those Fabulous Serial Heroines: Their Lives and Films (Scarecrow Press, 1990):97. ), her death certificate indicates her date of birth was June 19, 1892, and that she was born in Cook County, Illinois. See Ancestry.com. 1900 United States Federal Census [database on-line]. Provo, UT, USA: Ancestry.com Operations Inc, 2004. Source Citation: Year: 1900; Census Place: Chicago Ward 15, Cook, Illinois; Roll: 264; Page: 3B; Enumeration District: 472; FHL microfilm: 1240264; and also see John J. McGowan, J.P. McGowan: Biography of a Hollywood Pioneer (McFarland, 2005), n2, 209. McGowan indicates: "The confusion seems to have arisen because the record of her birth was not filed until many years after her birth. The record was lodged by Helen's uncle in 1942". ↑ Holmes' gravestone indicates she was born in 1891. See "Helen Holmes". See photo of gravestone: Photo of Gravestone of Helen Holmes. ↑ Brotherhood of Locomotive Firemen and Enginemen's Magazine, Vol. 62 (1917). ↑ Ancestry.com. 1900 United States Federal Census [database on-line]. Provo, UT, USA: Ancestry.com Operations Inc, 2004. Source Citation: Year: 1900; Census Place: Chicago Ward 15, Cook, Illinois; Roll: 264; Page: 3B; Enumeration District: 472; FHL microfilm: 1240264. ↑ John J. McGowan, J.P. McGowan: Biography of a Hollywood Pioneer (McFarland, 2005):63. ↑ Ancestry.com. 1910 United States Federal Census [database on-line]. Provo, UT, USA: Ancestry.com Operations Inc, 2006. Source Citation: Year: 1910; Census Place: Chicago Ward 28, Cook, Illinois; Roll: T624_273; Page: 11A; Enumeration District: 1244; Image: 965; FHL microfilm: 1374286. ↑ "Helen of Kalem", The Atlanta Constitution (March 14, 1915):A3. ↑ The Sun (Baltimore, MD: April 11, 1915):3A. ↑ William Carruthers, Loafing Along Death Valley Trails: A Personal Narrative of People and Places, 2nd ed. (Ontario, CA: Death Valley Publishing, 1951):126-127. Carruthers, William. Loafing Along Death Valley Trails: A Personal Narrative of People and Places. 2nd ed. Ontario, CA: Death Valley Pub. Co., 1951. Doyle, Billy H. "Lost Players," CI 156 (June 1988):C13. Everett, Eldon K. "Helen Holmes — The Railroad Girl," CFC 41 (Winter, 1973):37-39. "Helen Holmes, Silent Film Actress, Dies'", The Los Angeles Times (July 10, 1950):A3. "Helen Holmes", The New York Times (July 10, 1950):21. McGowan, John J. J.P. McGowan: Biography of a Hollywood Pioneer. McFarland, 2005. "SLK Announces Song Featuring Helen Holmes," Motion Picture Weekly (30 August 1919):1355. Wikimedia Commons has media related to Helen Holmes.